Fighting off the Skaven horde is something you’ll have become accustomed to if you’re an avid Warhammer Vermintide player. In the Karak Azgaraz DLC, you will fight through the Skaven invasion in an attempt to warn the dwarven hold of Karak Azgaraz and fend off the Vermintide, lest the dwarfs fall victim to the vermin. The Karak Azgaraz DLC features three brand new levels for you and three other heroes, be they bots or other players, to venture through, killing rat-kind in creative and gruesome ways. There are so many parallels and similarities to Left 4 Dead – in my opinion one of the definitive online co-op games of all time – it’s untrue. Having seemingly thousands of vicious and bloodthirsty pole-wielding rat people sprinting at you, throwing gas bombs and strangling you with a noose-on-a-pole is honestly exhilarating, and the combat itself is immensely satisfying – slaughtering several rats in one swiping melee attack often left me smiling with glee. I love the up-close-and-personal combat, it reminds me of DOOM and it gets your heart pumping. The first mission you’ll be undertaking as part of the Karak Azgaraz DLC is Khazid Kro. Khazid Kro is claustrophobic and dark – what with it being an outlying settlement, through which you must pass if you are to warn Karak Azgaraz. Throughout Khazid Kro, you will be talking to Halgrim Halgrimsson (who is a dwarf – no surprise there). 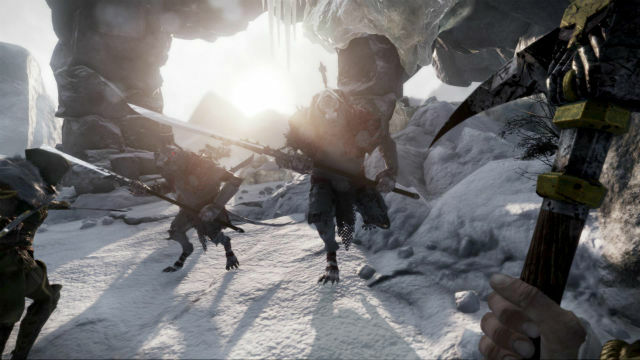 Halgrim is a survivor who communicates with you through what is essentially a Dwarven version of two cups on a string. He asks you to take out the Skaven tunnels with some explosive barrels – which he provides for you, willingly. The whole reason for visiting Halgrim is to obtain a keystone which will prove useful in further levels. After surviving Khazid Kro, you and your teammates will head to the mountains in search of The Cursed Rune. After a long and gruelling ascent through snowy mountainous terrain, you will have to fend off a huge Skaven onslaught in order to recover a casket from a vault. From there, you will have to escape the quarry you are in, fighting Skaven off all the way. These battles are intense and although my Warhammer knowledge is limited at best – venturing through the mountains felt like something straight out of any high-fantasy fiction. I felt a little bit like Legolas firing arrows off with almost 100% accuracy. It was so satisfying watching those filthy rat-men tumble off the cliff. 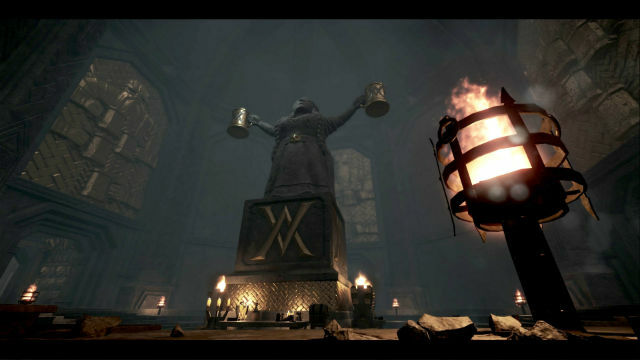 Finally, to conclude the Karak Azgaraz DLC, you must reach the peak of the mountain to light a beacon, warning Karak Azgaraz of the Skaven threat. All that stands between the Skaven and the downfall of the dwarfs are you and your friends. The Karak Azgaraz DLC experience would have been much improved with a healthier online community – I found only one other player online to play through a mission with. The AI leave quite a lot to be desired, being a little clunky and refusing to prioritise you being repeatedly stabbed by an assassin-rat over taking out a regular rat-grunt. It would be a great co-op experience… if only there were others to experience it with. It’s a real shame, as I thoroughly enjoyed Karak Azgaraz. It’s more of the same Vermintide gameplay, but with three additional maps to play through. Ultimately, Karak Azgaraz is a strong DLC offering, adding to a great combat experience, it’s just such a shame that there are so few players online to play with. Maybe the DLC came too late for Vermintide, but if something could draw the player-base back to Vermintide, Karak Azgaraz would complement the base game so well – with more loot on offer and a humongous patch rebalancing and fine tuning the heroes.